Just like we do, dogs suffer from muscle pains, aches and strains but they can’t easily tell us that they have a sore shoulder or that their knee is stiff. They usually don’t complain and tend to adapt to move around the problem so they can carry on with the job of being your best friend. When you do notice a change in their behaviour or the way they walk, professional canine remedial massage and myotherapy can help to ease any problems to bring noticeable and positive changes in your dog. Equally importantly, regular massage can help prevent the injuries from recurring. The AchyPaw team is Dr Les Ellam and Chris Penny. We use specialised knowledge and training from both canine and human massage skills and experience to detect and target troublesome areas in your dog. This will benefit both function and range of movement of their limbs while easing any associated pain. By being able to offer this multi-modal approach of massage, complementary therapy, myotherapy, exercise and advice, we offer an integrative holistic mode of care for your dog. Regular massage for your dog offers a drug free form of pain relief that can help to prevent recurrence of the conditions that caused the pain, keep your pet in top condition, help to maintain their health and comfort and improve their quality of life. AchyPaw Canine Massage service is based near Brighton. This safe and affordable complementary treatment is not just for recovery and rehabilitation as massage and myotherapy can also help active athletic dogs, keeping them in top condition for sport or just for the activity in daily life which can help to prevent any injuries. 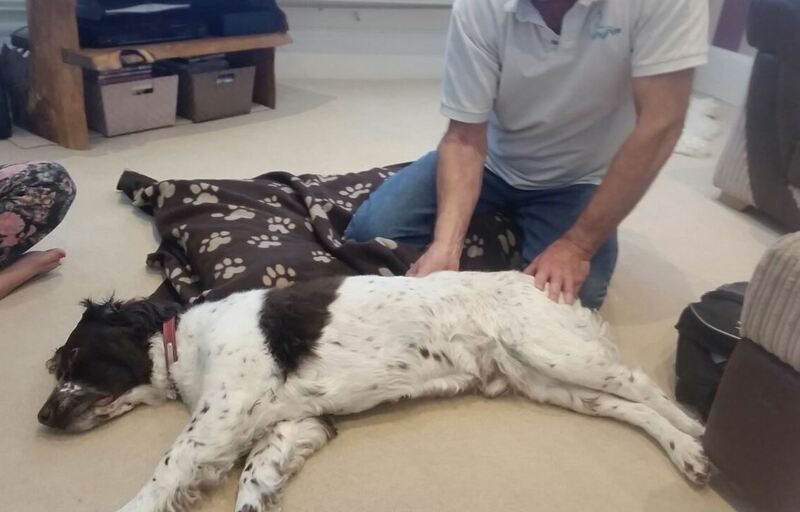 Older dogs who maybe find it hard to settle down as their joints are getting stiff could also benefit from a massage session which can help to prevent issues occurring as they grow older and any existing arthritis. All our treatment plans are one on one being individually tailored to the needs of you and your dog. We also offer a multi-dog household service where we will visit with two therapists. As well as offering therapy, we deliver classes and training sessions tailored to your needs. These can be for groups or one to one sessions. Our YouTube channel has a variety of videos from some of our training sessions. Click here for a referral form, as veterinary consent is necessary for canine massage & myotherapy. Completion of this form typically involves no charge and many insurance companies will cover this therapy (check your policy).